What a beautiful dog! 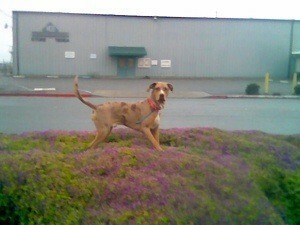 A lot of people think Catahoulas only come in black/gray, so I am glad to see one of a different color. I know you have a lot of fun with your pup! I know little of a Catahoula and now that I've seen your dog, it makes me desire to research and learn more about this breed. He looks like he's enjoying his outing very much and is certainly not camera shy. Yes, he really is beautiful. I love Catahoulas. Thanks for sharing your picture with us. Greetings from Walker, LA! I love his name and he sounds like quite a character. I love how each dog is such an individual personality. You're lucky to have such a handsome and funny dog. He is gorgeous and looks like a cookie! And what a cute personality. How fun.